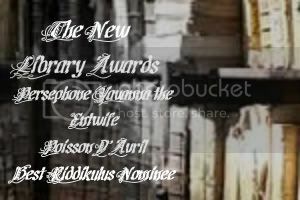 I'm now an official nominee for The New Library Awards ( tnl_awards) in the category "Best Gen Humour" for my story Poisson d'Avril. The voting has now started -- you vote by screened comment to this post, but it's important to read the rules, or your vote won't count. One of these rules is in each category, please list two (no more, no less) stories that you would like to see win. The list of nominees is here, with my competition fellow nominees in the humour category listed here.